BARBER – Thelma Louvina “Peggy” Barger Koontz, passed away peacefully on Saturday, Sept 8, 2018, at the Laurels of Salisbury Nursing Facility. Born June 21, 1928, in Davidson County, NC, she was the daughter of the late James Riley and Sarah Edwards Barger. She was educated in the Rowan County Schools. Mrs. Koontz retired from the Rowan County School System with over 22 years of dedicated service to the children of the Cleveland community as a cook in the Cleveland Elementary School Cafeteria. 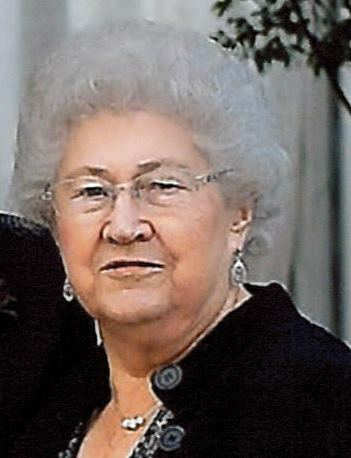 In addition to working on the family farm in her earlier years, she also worked at Rickman Manufacturing in Salisbury. Her leisure years in retirement were filled with many vacation trips with husband Jack and many other family members, to the beach, mountains, and across the country. She enjoyed endless hours of needlepoint, knitting, crocheting, and quilting with her mother and her sisters at family quilting gatherings. She also enjoyed visiting all of her grandchildren and having them stay with her during school summer vacations. Another of her great pleasures was nurturing all of the flowers she so caringly grew all around her yard. In fact, one of her spider lilies reemerged from years of dormancy during her final week, no doubt as a fond farewell! In addition to her parents, she was preceded in death by husband Earl W. “Jack” Koontz, infant daughter Sandra Kay Koontz, sisters, Essie Young, Geneva Bell, Myrtle Briggs, Callie Kluttz, Gurla Watson, and brothers, Marvin Barger, Buck Barger, Jake Barger, & Tom Barger. Those left to cherish her memory are sons Richard Earl Koontz and wife Brenda of Simpsonville, SC, and Steven Craige Koontz and wife Linda of Summerfield, NC. Grandchildren Michael Koontz, Jeffrey Koontz (Amy), Lisa Suprenand (Paul), Julie Cline (Chad), Lauren Sigmon, & Greg Sigmon (Kate). Great Grandchildren, Emory Koontz, Jack Suprenand, Kai Suprenand, & Thomas Hankins. Also, surviving are sisters Georgia Harris and Lizzie Wagner, and brother, Joe Barger (Barbara), sisters-in-law Arlene Hedrick (Ernest) and Carole Burkhart (Gary). The family wishes to thank all of the wonderful staff of the Laurels of Salisbury for all of their loving, compassionate care of Peggy over the last year & a half. They truly made it a home away from home for her. The family will receive friends Tuesday, Sept 11th from 1:30 pm to 3:30 pm in the Church Parlor at Salem Lutheran Church at 5080 Sherrills Ford Road, Salisbury, NC., followed by the funeral at 4 pm, conducted by Rev. Dawn Rister. Interment will follow in the church cemetery. Memorials: In lieu of flowers, memorials may be made to the Salem Lutheran Church Cemetery Fund or the Trellis Supportive Care of Rowan – 101 Hospice Lane, Winston Salem, NC 27103.